Daily flights between Manchester and Hong Kong are being introduced on 1 December by Cathay Pacific in a significant upgrade to its operations from the North West. Plans to develop land on the north side of Durham Tees Valley Airport for housing and a local services area for retail, commercial, leisure and community use have been backed by Darlington councillors. An ex-Brussels Airlines Avro RJ100 is on its way to the Southend Airport-based independent charter carrier Jota Aviation after the company signed a letter of intent with the leasing company Falko Regional Aircraft. Shangri-La Hotels and Resorts is to unveil the first Kerry Hotel in Hong Kong and its fourth property in the city on 28 April to give the city its first new-build hotel to open on the Kowloon waterfront since 1995. A £400m upgrade for Club World long-haul and self-service check-in and biometric boarding gates to accelerate passengers’ journey through the airport are part of a major investment package announced by British Airways last week. General managers from all 14 hotels and resorts in the Como Group have kicked off the latest awareness campaign for the Singapore-based company’s luxury properties around the world with an event at the Nobu restaurant in the Como Metropolitan Hotel in London. A second daily service between Dubai and Bali is being launched by Emirates on 2 July to offer more connectivity options in face of growing demand from both leisure and business travellers. Flights will be by B777-300ER. Deliberately sending emails to millions of people who had opted out of receiving them has cost Flybe a fine of £70,000 after an investigation by the Information Commissioner's Office (ICO). In another extension to its programme to care for Passengers with Reduced Mobility (PRM), including those with disabilities or who experience other issues, Gatwick has established an ombudsman service to resolve disputes that may arise. Two new year-round routes between Gatwick and Seattle and Denver are being launched by Norwegian in September as the carrier continues its promised transatlantic expansion with a strong pitch to business travellers. Four million passengers and 32,000 flights after it started, easyJet on Tuesday celebrated its fifth anniversary at Southend Airport. 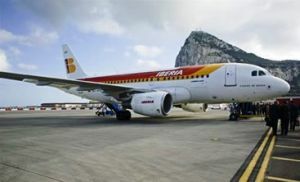 The airline now flies to 15 destinations across Europe; Amsterdam, Alicante, Faro and Malaga are the most popular. Tarragona is just about to hit the big time. Once again. In the days of the Romans it was a major Mediterranean port and is a World Heritage Site. However over the years it has been eclipsed by Barcelona 50 miles to the north. It hosted 14 cruise ships in 2012, 21 in 2016 and an expected 42 this year. The reason for the optimism can easily be seen from the port. This is the answer to the cockpit question in last week's BTN "Delta’s magnificent 747"
Below is an image from another angle. A new state-of-the-art noise monitoring and track keeping system is being launched at Biggin Hill Airport on Wednesday (12 April) which allows anyone to access details via an internet portal of user aircraft and those overflying the London area. With the largest Hilton development pipeline in the Middle East, Saudi Arabia has seen the opening of the group’s Makkah Convention Hotel, with views of the Sacred Mosque, Al Masjid al Haram, and the city's largest ballroom and convention centre. Still one of the most popular passenger aircraft, the BAe 146/Avro RJ is finding a new role as a wildfire fighter in North America, with 22 in service or under conversion for the role. A new £130m arrivals building covering 34,000sq m over three levels to be built next to the current terminal at Stansted Airport was granted planning permission on Wednesday by Uttlesford District Council. Airbus has completed the maiden flight of the first A319neo, the smallest member of what the manufacturer claims is the world’s best-selling single-aisle product line, the A320neo Family. First pictures were released last week of how the restored Waldorf Astoria New York will look when the hotel reopens after a major renovation that began last month. The famous building is expected to be back in business in three years. Airports across New Zealand may have to extend runways or face new restrictions on the type of aircraft which can operate there, the NZ Civil Aviation Authority (CAA) has warned. An ambitious expansion programme at Saudi Arabian Airlines (Saudia), saw the company on Thursday launch its first direct flight between Jeddah and Port Sudan. Major improvements to the airport in Estonia’s capital, Tallinn, were outlined at a reception at the Estonian Embassy in London last week to mark the launch of British Airways’ direct service from Heathrow the day before.